Everything I know about sea creatures, I learned from Octonauts. And I'm not even kidding. We went without cable for a long time. Not long ago, we decided to reinstate our cable subscription. The girls discovered fun and new channels, including Disney Junior. Disney Junior is now the ONLY channel that ever graces our TV screen while the children are awake. They love all of the shows. But there is one that trumps them all in Chica's eyes. Several times a day I hear the alert for "Creature report! Creature report!" And I know that something fun and educational will be following. 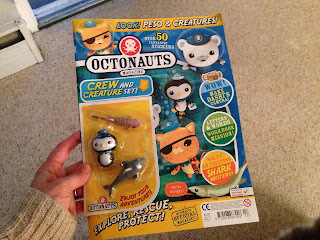 Octonauts, in case you are unfamiliar, follows the adventures of a team of underwater explorers (there are 8 of them - get it? 'Octo?'). This team, made up of various animals from cats and dogs to bears and penguins, explore the world's oceans. During their explorations they rescue sea creatures and protect sea habitats. And they are so stinkin' cute. 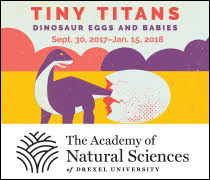 At first, I thought these were creatures Octonaut's made up. 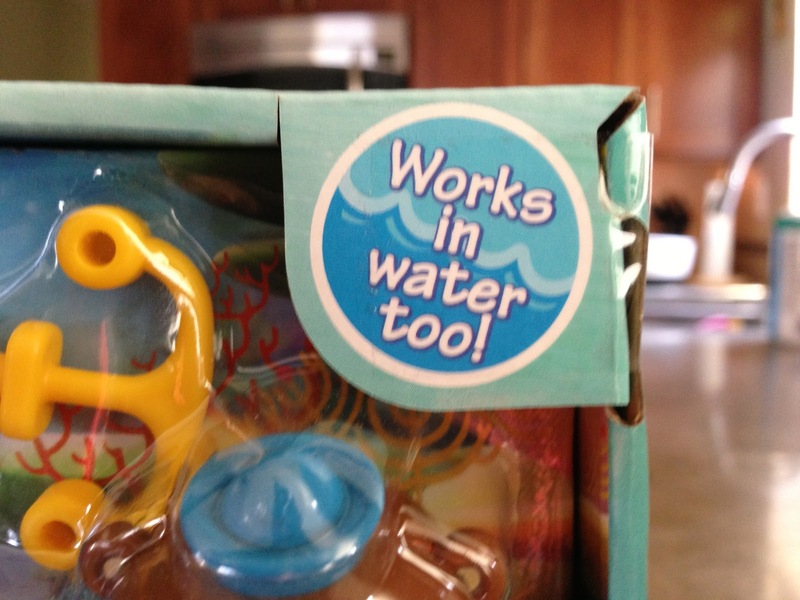 BUT THEY ARE REAL. All the marine life facts my daughter is learning are real. So imagine her joy when we received the opportunity to check out the new Octonauts toys from Fisher-Price! Bath time has become our favorite time of day because Chica and Bug get to become part of the Octonaut team with their water-friendly toys. Chica usually maneuvers the Gup-C (complete with color-changing creatures and a rescue tool), while Bug propels the Gup-D (Captain Barnacles included!). We've also got various rescue missions sets involving Tunip and a clamshell, as well as Kwazii and the Slime Eel. 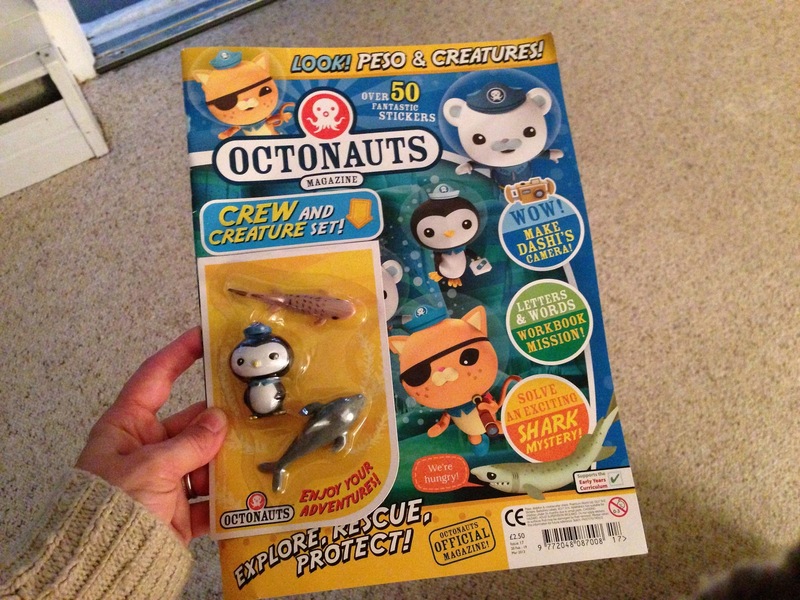 The package also included this awesome Octonaut's interactive magazine. Chica takes it to bed to "read" every night! 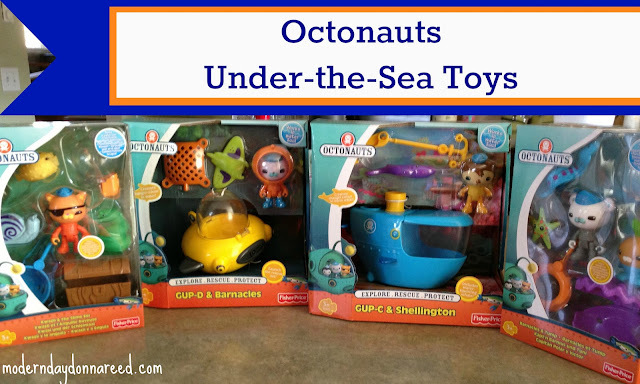 If your kids are as crazy for Octonauts as mine are, you can now find the Octonaut toys at Toys R Us. Octonauts airs on Disney Junior at 6:30 AM EST/5:30 AM CT. Follow Octonauts on Facebook and Twitter.